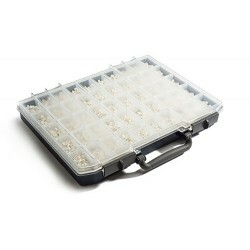 50 Compartment cable marker kit containing PA2 (Size D) markers. Kit contains 200 pieces of each number 0-9 (inclusive) and 100 of each A-Z (inclusive), +, -, / and earth. All feature black text on a white marker.